Vada's Blog Stamp Inks and Paper : Kardkarzy Tag Tuesday theme is “Spring”. I love the idea of a House for a tag, so here’s my House Spring Tag. Little girl image is from “Chicks 57 Vintage Postcards”. Stamps used are Hero Arts, Stampin’ Up and Great Impressions. This is such a beautiful tag Vada! Oh, Vada! This is such a wonderful house tag - love it! Vada - this is a lovely spring house tag! Great fun - cheers! Lots of neat things on this darling card, Vada! Cute tag with lots of fun embellishments! A wonderfully collaged spring house! Oh my goodness, I love everything about this tag! Wonderful house tag. I love the spring colours you used. What a fun shape Vada! and such a clever spring tag! Oh wow!!! 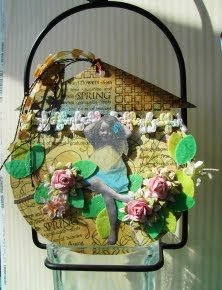 Stunning spring tag - so many beautiful details!